Angry Democrats Vow "Day Of Reckoning Coming For Republicans"
After a nailbiter of a Supreme Court nomination until the very last minute, angry Democrats have come out in force, vowing to extract revenge on Republicans with the nation’s top Democrat urging supporters to make Republicans "pay a price" for putting Brett Kavanaugh on to the Supreme Court. As the Washington Examiner reported, in a fundraising email that follows threats from other public officials over President Trump’s second court victory, DNC Chairman Tom Perez wrote, "Make Republicans pay a price for Brett Kavanaugh." Here is one thing we've learned from the Brett Kavanaugh fight: We can never, ever, trust congressional Republicans to stand up to Donald Trump. In just 30 days, we have a chance to elect Democratic majorities in Congress -- and for the sake of our democracy, we must. It's not enough to get mad, Clinton -- we have to beat the Republicans who rammed this nomination through. Time and time again, Republicans have shown that they can't be trusted to stand up to the Trump administration on a single thing. So it really is this simple: If we don't want people like Brett Kavanaugh to be appointed to lifetime positions in our federal judiciary, we need to elect Democratic majorities this November. Democrats only need to flip two Senate seats this November to win control of the Senate and make sure Trump can't ram through any more judges like Brett Kavanaugh to the Supreme Court. Meanwhile, the liberal group American Bridge 21st Century vowed that "a day of reckoning is coming for Republicans." Perhaps, but it will be an uphill battle. 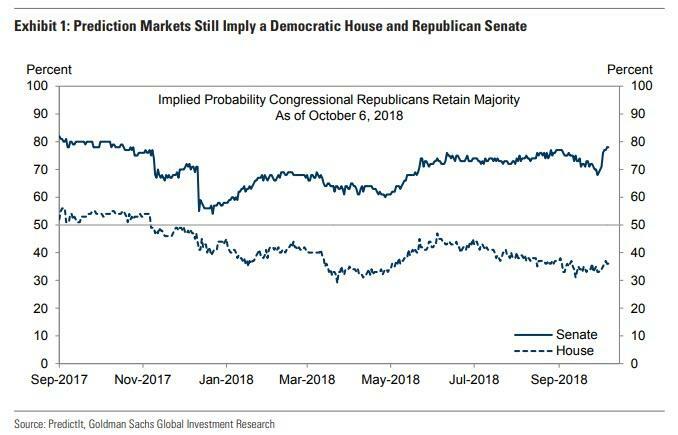 In a note over the weekend, Goldman economists wrote that the consensus view in financial markets appears to be a Democratic majority in the House and a Republican majority in the Senate. And while that is also Goldman's expectation for the most likely outcome in our view, with one month to go much could still change. And while conventional wisdom is that Republicans will lose the House, sentiment is shifting rapidly.